WOODSTOCK, Illinois—December 13, 2013— NewerTech, a leading developer of Macintosh®, PC, iPod®, iPhone®, and iPad® performance upgrades and accessories, announced its new line of NuGuard KXs Impact X-Orbing Screen Armor for the iPhone 4/4S/, 5/5C/5S, iPad mini, iPad mini Retina, iPad Air, and full size iPad. Protection against accidental drops, impacts and scratches comes without sacrificing looks or adding bulk, and two coverage options - Full Size and Case Friendly - offer choice, while three-layer, ultra-thin, hyper-advanced energy x-orbing protective layer offers incredible scratch, shatter, and impact protection without impeding the display or affecting the screen’s touch sensitivity or clarity. "The NuGuard KXs does it all - superior protection and great function - without impeding the display," said Larry O’Connor, president of NewerTech. "It takes the hit, so your iDevice doesn’t have to, keeping your screen looking like new. It’s a perfect complement to the NewerTech KX line of energy x-orbing cases for iDevices." The NuGuard KXs "Case Friendly Design" leaves a small gap around the edges of the screen for a perfect fit when paired with the NuGuard KX line of iDevice cases. The Full Size Design protects from top-to-bottom and side-to-side across the entire screen. Three separate layers combine into one ultra-thin, 0.28mm thick protective shield. Protection Layer: Crystal clear display coating keeps dust and dirt away from the iDevice's screen with no image distortion, yellowing or hazing over time. Absorption Layer: Military-grade kinetic energy X-orbing protection layer is hammer-hit tough, with a "3H" hardness scale rating and can even self-heal from minor impact dents. Adhesion Layer: Self-adhesive layer requires no water or other liquids to install and provides a bubble-free look with no sticky residue if removed or repositioned. The NuGuard KXs family of Impact X-orbing Screen Armor products is available immediately, starting at $14.99. 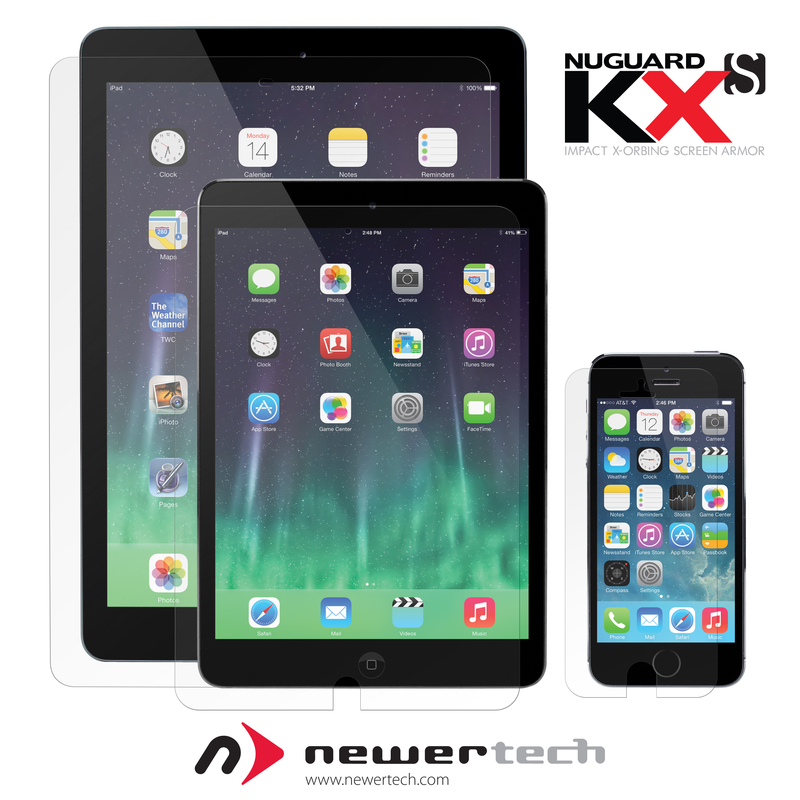 For more details on the NuGuard KXs Impact X-orbing Screen Armor and to locate a reseller, visit http://www.newertech.com/sales. Since 1984, Newer Technology Inc. (NewerTech) has been recognized as the leading developer of performance upgrades and accessories for Macintosh and PC computers, iPods, iPhones, and iPads. NewerTech industry and product awards include the 2012 CustomRetailer EXC!TE Award, the 2012 American Business Award "People’s Choice" Stevie® Award, the Parent Tested Parent Approved (PTPA) Seal of Approval, and the Handyman Club of America Seal of Approval. NewerTech is headquartered in Woodstock, Illinois. Dealer inquiries are welcome at 815-308-7001 or by emailing sales@newertech.com. Follow NewerTech on Facebook and Twitter. Newer Technology and the Newer Technology arrow logo are trademarks of New Concepts Development Corporation, registered in the U.S. Patent and Trademark Office. The Newer Technology logo is a trademark of New Concepts Development Corporation. NuGuard is a trademark of Newer Technology, Inc., registered in the U.S. Patent and Trademark Office. Apple, iPad, iPhone and iPod are trademarks of Apple Inc., registered in the U.S. and other countries. Other marks may be the trademark or registered trademark property of their owners.